Inshanks and Slockmill farms are situated in the Rhins of Galloway peninsula, the most southerly part of Scotland which is renowned for having a mild climate and one of the earliest growing seasons in the country. The farms lie near to the town of Drummore and believe it or not are on the same line of latitude as Penrith in Cumbria. The McClymont family have been farming in the area for many generations and have recently sold their farms. 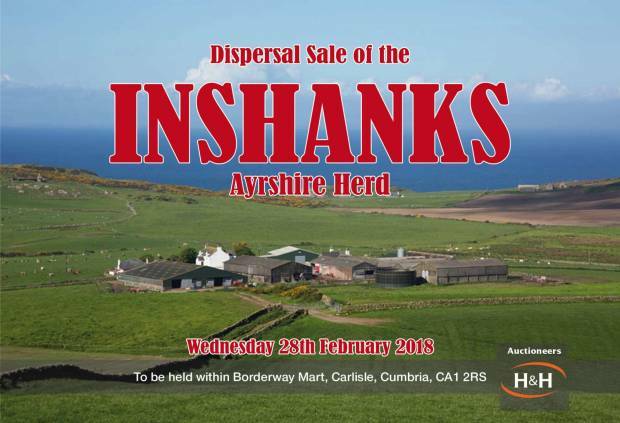 This complete dispersal sale offers milk producers and breeders a special opportunity to purchase quality pedigree Ayrshire cattle that are tough and robust and have the genetics to produce large volumes of high quality milk from grass. The farm had been supplying First Milk Nestle group with the highest quality milk for many years. The herd is in the Top 4 in the Nestle group for combined butterfat and protein. The Inshanks Ayrshire cattle are strong framed and are in excellent body condition, their feet and legs are exceptional.